The US military has said 10,000 US and Iraqi troops are taking part in a major operation against militants linked to al-Qaeda north of the capital, Baghdad. The offensive started early on Tuesday with a ground and air assault to secure the city of Baquba in Diyala Province, a centre of the Sunni Arab insurgency. The US says 22 militants have been killed, but local officials say there have also been civilian deaths. Separately, police say a truck bomb in Baghdad has killed at least 75 people. The massive explosion near the Shia al-Khilani mosque, which wounded at least 130 others, rocked the centre of the capital and sent large clouds of black smoke into the air. The bombing came only days after suspected Sunni militants attacked the al-Askari shrine in Samarra, one of the most revered sites in Shia Islam. 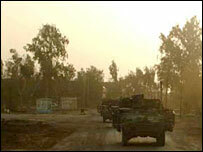 In Diyala, Operation Arrowhead Ripper began overnight with troops being brought in by helicopter. Tanks and armoured vehicles were also used on the ground, with Apache helicopter gunships providing air cover. "Task Force Lightning commenced Operation Arrowhead Ripper today in a large-scale effort to eliminate al-Qaeda in Iraq terrorists operating in Baquba and its surrounding areas," the US military said. "The end state is to destroy the al-Qaeda influences in this province and eliminate their threat against the people," said US commander Brig-Gen Mick Bednarek. Local sources said there was heavy fighting in the west of city, which has become an al-Qaeda stronghold in recent months, as troops tried to take control. Iraqi troops broadcast messages on loudspeakers telling people to stay indoors, but a number of wounded and dead civilians were soon taken to the city's hospital, officials told the BBC. The head of the emergency services in Baquba said his ambulances were not being allowed into the area to pick up other casualties and there were fears that the numbers would rise. The US military said the operation's chances of success have been improved by information provided by former insurgents. "Over the past several weeks, we've seen that a number of the former insurgent groups, Sunni groups, are actually growing very tired of the al-Qaeda influence in the province - tired to the point where they're giving coalition and Iraqi security forces information that has been very helpful," US Sgt Thomas Clementson told the BBC. Diyala has seen some of the worst violence in Iraq this year. The latest operation's strategy is the same as in Baghdad - clear, hold and build, according to the BBC's Andrew North in the capital. US troops do the initial clearing and Iraqi forces hold areas afterwards, followed by rebuilding efforts to win people over, he says. But the approach has met with mixed success in Baghdad so far and, as has happened so often, the insurgents respond by simply moving elsewhere, our correspondent adds. The US military is due to report on the success of the build-up in September. In July, funding measures go before the US Congress and in September, political and military assessments of the surge and the overall situation in Iraq are due.